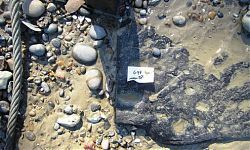 As more of the jetty has eroded, it’s construction has become clearer and we now think the last phase dates to roughly between 1550 and 1650. These dates span the period when the Tudor Greenwich Palace was demolished and the King Charles block of Greenwich Hospital was built, which leaves us with a few more questions. 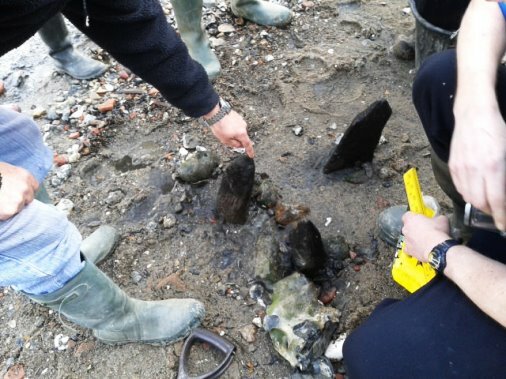 Luckily for us, Historic England has been keeping up with our work, and they commissioned dendrochronology to date the timbers on the foreshore at Greenwich. Dendrochronology (often shortened to dendro dating) is the science of dating wood by measuring the widths of the annual tree rings. Each year the amount a tree grows is effected by the climate which then determines the width of the tree ring for that year. For instance, the tree will have a narrower ring in a dry summer. Dendrochronologists take a sample of wood, and match the pattern of rings against a database of known dated wood. If the sample includes the sapwood and bark of a tree, then you can date the year the timber to the year the tree was felled (and sometimes even the season). This then gives you the earliest date possible date for the feature. 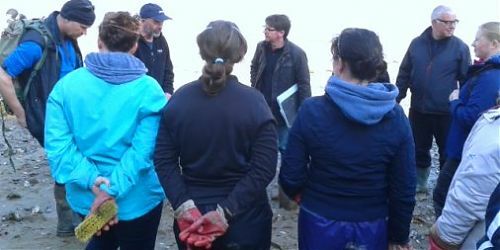 During fieldwork in April 2015, Professor Nigel Nayling and Dr Roderick Bale from the University of Wales Trinity Saint David joined us on site and whilst they were here, they gave us a bit of a masterclass in what makes a good sample for dendrochronology, and what we can look out for on the foreshore. What makes a good timber sample? Sapwood and bark: if this is present, then the dendro dating can calculate when the tree was felled, which can then give us the earliest date for the structure. For instance, if the tree was felled in 1650, then the structure must’ve been built after that. The inner black wood on this timber is the heartwood, and the lighter, brown area is the sapwood. At least 50 rings: this doesn’t necessarily mean that the biggest timbers are the best! It all depends how the trunk was converted. If the trunk was quartered or cleft into wedges, then even a small post could contain enough rings. For more information about timber conversion see our factsheet. 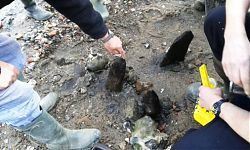 The erosion and damage to posts on the river foreshore can make this hard to work out, which is why we spend a lot of time carefully cleaning. 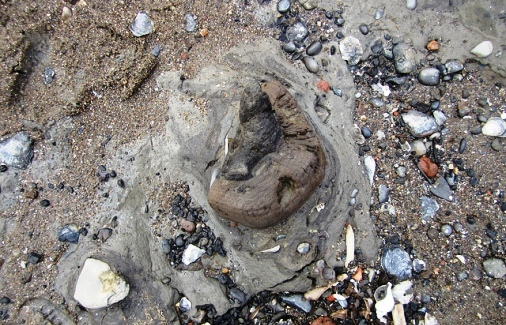 This unassuming little post is actually a possible sample, because it’s been radially cleft from the trunk. Species: oak can be easily dated, elm is difficult if not impossible. Oak trees produce rings in even widths, so they make good samples. Elm, on the other hand, has wibbly wobbly rings, with no reliable pattern, which makes it very hard, if not almost impossible to date them. At Greenwich, once the mud has been cleaned of the timbers you can tell oak and elm apart; oak is a dark black colour, whereas elm is a deep red. Generally oak was used in construction during medieval and later periods, with elm only being used from the 1550s onwards. 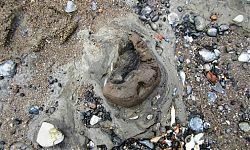 Unfortunately for us, much of the jetty is built out of elm, which is one of the reasons why we date it to post-1550. Destroying the evidence: taking a sample means literally sawing off a piece of the timber. Although it can be done by making a bore hole, this is more difficult. So taking samples is destructive, so we should only take them as necessary. Records, records, records: it’s really important to record which timber the sample came from and where it was in the structure. 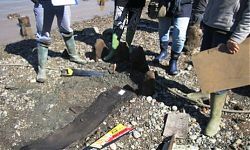 We made sure that all the timbers on the foreshore were planned before they sampled. We also completed a timber sheet for each one, which gives each timber it’s own individual number and records what kind of timber it was, how it was made, and any carpentry marks. Thank you so much to Nigel and Rod for being so willing to talk about what they do. 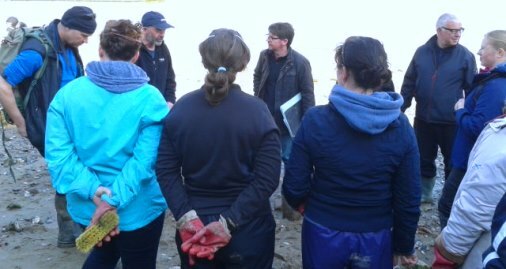 It was great to spend time with passionate and knowledgeable people, and we’re looking forward to finding out the results of their work! 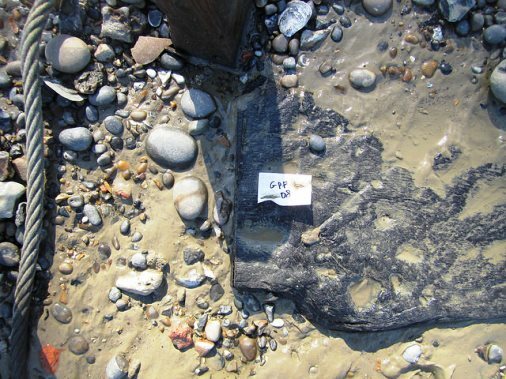 Unfortunately, we’ve recently heard from Rod that none of the samples taken at Greenwich returned any dates….recording work and research on the jetty structure will however carry on!